Charles Hugh Smith* sees most pension funds as being "dead men walking" by central banks' imposition of low yields on safe investments, i.e. 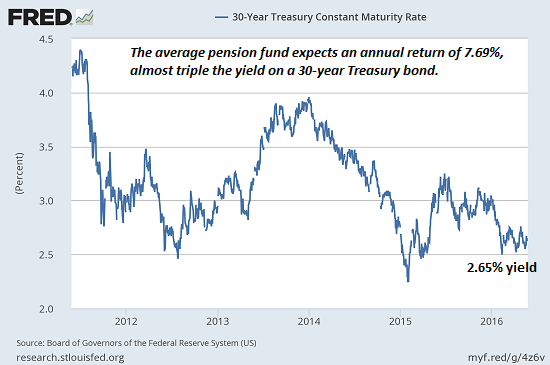 Zero Interest Rate Policy (ZIRP) .. "Here's problem #1 in a nutshell: the average public pension fund still expects to earn an average annual return of 7.69%, year after year, decade after decade. This is roughly triple the nominal (not adjusted for inflation) yield on a 30-year Treasury bond (about 2.65%). The only way any fund manager can earn 7.7% or more in a low-yield environment is to make extremely high risk bets that consistently pay off. This is like playing one hand after another in a casino and never losing. Sorry, but high risk gambling doesn't work that way: the higher the risk, the bigger the gains; but equally important, the bigger the losses when the hot hand turns cold .. This set of bubbles is the last one central banks can blow. And when markets free-fall and don't reflate into new bubbles, pension funds will expire, as they were fated to do the day central banks chose zero interest rates forever as their cure for a broken economic model."